A little over a year ago, Heather Monahan seemed to have it all including her C-suite position. That is until she received an email telling her to fly home from LA and drive from Miami to Naples for an important meeting with her new CEO. Little did she know that within 5 minutes of arriving at headquarters she would be fired after 14 years. Heather had successfully climbed the corporate ladder having been promoted multiple times. She was even recognized as one of the Most Influential Women in Radio thirty days before her unexpected termination. At that moment, Heather had to decide if she should go back and do what she had always done or take a major leap of faith and go to work for herself while pursuing her passion to elevate others. Jobless and scared, Heather decided to go for it and do something she never imagined she could do. She made the decision to start her own company, Boss In Heels LLC and write her first book, Confidence Creator. 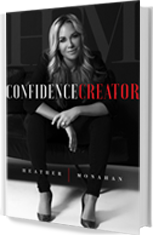 “The biggest confidence building moment I have created is getting fired and taking the chance on myself to write this book”, said Heather Monahan. “That was the scariest professional risk that I have ever taken”, she said. Confidence is not created overnight. In fact, Heather says it was and is a daily struggle. While writing the book, she second-guessed herself many times. She questioned if the book was going to sell, what if people don’t like it and what happens if she fails? “It took every bit of my confidence to put myself out there and just jump off the ledge, not knowing what was going to happen,” said Heather. Heather’s fears were ultimately not real, however, her decision to create a book comprised of the lowest moments in her life challenged her ability to face fear and overcome it. She now shares that the feeling of fear is actually a green light. “When you feel fear creep in, it’s actually a sign you need to move faster to get to the other side. Once you do that, the fear is gone and your confidence has been created”, she shares. But still, in those trying times, she would struggle to listen to her inner voice. She would stop herself in those scary moments and know that there are certain levers she could pull. One of the levers was the ability to call on key people who she knew would be there to help her grow, people who believed in her. “We need to have those people in our life. Those are the people who are going to build you up and help you listen to your voice,” said Heather. Less than a year later, Confidence Creator was released and became an Amazon Best Seller in Business Biographies and Motivation as well as Personal Transformation. In the book, Heather shares stories from her childhood, career, and life experiences. Throughout the book, she talks about how she found her confidence and how we can get to a place where we are truly confident and empowered. Heather encourages her readers to just go for it and take that leap of faith. Heather shares that she still struggles with confidence, but now knows how to rebuild it when it dips. “No one is confident all of the time and learning to rebuild that muscle when you need it is key to living your best life,” Heather says. “By allowing yourself to be vulnerable and share your flaws, it helps build your confidence. The people that pretend they are perfect are actually the ones that are the most insecure. When you get to the point you can own the real you, flaws and all, that’s the moment that your confidence really takes off. You force yourself to grow in those moments. It’s much scarier to sit comfortable and complacent, not growing and not living up to your potential in life, “said Heather. Heather constantly hears stories from men and women who have read her book and because of her advice they took the leap to change their lives. She says that you are either building your confidence or chipping away at it in every moment. You are the only person who can answer that question for yourself. She encourages people to challenge themselves every day to build their confidence and put themselves first. Heather tells her readers and those she speaks to that it’s all about making good decisions. She says that we are always going to have the right answers for ourselves. She says to stop asking everyone else what you should do and instead get calm and listen to your own thoughts. Listen to the one voice in this world that really counts, which is your own. Firing the villains from your life will allow you to take off. And when you can’t fire a negative person from your life, the act of creating boundaries to protect yourself and respect yourself will build your confidence immediately. So what’s next for this confidence creator? Heather has created a 7 part video series that shares the key confidence building tips from her book for those who would rather watch instead of reading. The video series will be available on her website, https://heathermonahan.com/ later this month. She’s also giving away a free e-book on her site to jumpstart your confidence and when you sign up for her accountability partner list, you will receive a daily email from Heather to keep you focused on your confidence creation. You can expect more books from this powerhouse as she has just started her second book. Heather has also begun a speaking tour spanning the country and you can find out when she will be in your city by following her on socials @heathermonahan or signing up for her email list on her website. Stay tuned for a lot more from this powerhouse! Now, go here and get her book and create your confidence! Click here! Alison Maloni is a media expert, President and CEO of Alison May Public Relations and public speaker. The former journalist has been seen on Dr. Oz and been quoted in multiple news outlets.